Over the past couple of weeks, we've introduced Tskili and Simon, two of our education ambassadors. Here's their story. Early one October morning, Tskili was found in his aviary sitting on the ground and looking a bit strange. Mary Anne immediately rushed Tskili to the vet. He was very anemic and barely hanging on, which was a big change from a few days prior when he helped give two programs to record crowds at an event in Richmond. His initial exam showed that he would not make it much longer without an immediate emergency blood transfusion. Mary Anne was in a complete state of shock and upset, but hope emerged when the vet asked Mary Anne if she had another Great Horned Owl. Mary Anne immediately raced across town through crazy Houston traffic to pick up Simon. Upon Simon’s arrival, she donated as much blood as she safely could and Tskili was treated. Thanks to the life-saving gift from his new baby sister, Tskili pulled through! He is still recovering and is making steady improvement. The vets have determined that he has kidney disease, but with supportive care and lots of fluids, he should be just fine. They will continue to check Tskili’s blood levels over the next few months and his meals are injected with water to keep him hydrated. After 26 years of inspiring and educating people from coast to coast, Tskili is ready for his well-deserved retirement. The team at Houston Audubon looks forward to continuing to care for Tskili and spoiling him silly. As for Simon, she was woozy after the anesthesia but recovered quickly and was back to educating three days following blood donation to Tskili. You can meet Simon and Tskili, after he’s fully recovered, at the Houston Audubon Raptor and Education Center, opening in 2019. Don’t forget to bring them some mice when you visit! 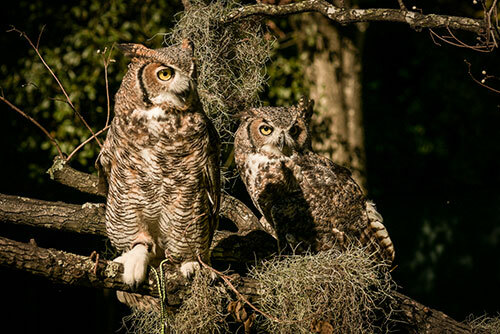 If you’d like to help Houston Audubon’s conservation efforts, including taking care of our feathered friends like Tskili and Simon, please contribute for #GivingTuesday by clicking here.